A proven methodology to migrate data with success. Moving data can improve visibility and performance, but safely crossing that bridge can be a high-risk proposition. There’s a reason companies turn to migration experts to move data with confidence. Data migration is a complex task—from replacements and upgrades, to system consolidation and relocation—safely transitioning data while keeping the business running smoothly can be a tall order for nearly any organization. Many IT departments struggle with managing a seamless migration process, which creates poor system performance, data loss, unplanned downtime and ultimately, disruption to the business. Data is the lifeblood of any business, so treating it with care and ensuring accuracy and availability before, during and after a migration is absolutely mission-critical. Using cStor’s expert data migration services, you can ensure a fast, smooth transition. Our proven methodology helps reduce costs, speed return on investment, reduce downtime risk, improve performance and offers a safeguard on application availability. It also means end-users experience minimal to no impact during everyday operations, helping to keep the business running at peak performance throughout the process. Reduce Costs. Avoiding unplanned downtime and data loss means the business keeps running while data is migrated to more cost-effective, flexible systems. Decrease Risks. Data migrations pose significant risk to the business, so teaming with an expert partner and employing a proven methodology helps mitigate risk. Limit Disruptions. A well-planned migration project takes into account any necessary outages while helping maintain business continuity and operational stability. Our expert Solution Architects guide you through our proven Data Transition Methodology to ensure your migration process is well-planned from end-to-end. We employ a rigorous, consultative process that guides you through our assessment, preparation, migration and operational phases. From there, our Engineers objectively monitor and test accuracy, availability and system stability to ensure your migration project is flawlessly executed with optimal speed and minimal risk. Our team also recommends best-of-breed solutions and best practices based on your specific requirements, pulling from expertise and options across the entire spectrum of our technology solution partners. Cloud & Automation. Moving data to the cloud in order to deploy new automation processes takes careful planning and execution expertise to ensure minimal downtime, zero data loss and accuracy within the new business workflows. Changing Cloud Providers. The cloud provider market is vast and new vendors are continually optimizing their offerings. Moving data between providers often requires an advanced, expert team to ensure a smooth transition process, from business requirements and workflows being thoroughly vetted to accurately carrying it all over to the new provider. Moving to Virtualized Infrastructure. Many businesses are moving to a virtualized infrastructure which improves elasticity while keeping costs under control. Such projects require delicate support of the data migration process to ensure accuracy, user experience and system availability remain intact post-launch. Moving Between Systems. At times, your team may need to move data between systems to support new implementations or upgrades. Ensuring a successful data migration plan keeps the business running at optimal performance from beginning to end. 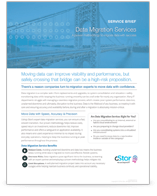 Download our Data Migration Services Brief to learn more.